I’m originally from near Sydney and I spent about six years of my teenage years overseas in Zambia in Africa before moving back to Australia for year 12. I was interested in nutrition and sport, so went into dietetics at The University of Wollongong. After that I got straight into work, moved to the country for a bit, then moved back to Sydney and decided, “Alright, let’s go overseas,” because there weren’t any jobs in Australia at the time. I thought, “I’ll do a couple of locums in the UK”—seven years later, I’m still here. I’m looking at moving back to Australia in the next year or two because I’ve started missing Australia and the beach. I’m also quite passionate about sport and being outdoors. Is it difficult for dietitians to work overseas? Not particularly, I think it’s just a bit of a different process. There’s a lot more locum work in the UK than there is in Australia. I’ve had locum work in Australia, but it’s usually rare whereas in the UK, there’s locum work in the hospitals every week. I’m getting emails all the time about jobs across the country, particularly in remote areas. To work over here you must be registered with the Healthcare Professions Council (HCPC). You also need to be registered with HCPC and it’s about a 50-page application form. You’ve got to get references from your lecturers and other people, and get transcripts of your degrees and all sorts of stuff to get registered. It takes a few months to get it processed, and then once you’ve got that, you’re legally allowed to work as a dietitian in the UK. What did it feel like moving to a new country and getting a job? Do you have any stories? So, I had about a half an hour time point where I was like, “Okay, can I get a flight tomorrow? Do I want to get a flight tomorrow? And can I pack my belongings up tonight?” In a split-second decision, I was like, “Alright, let’s go for it.” So, I booked a ticket for the next day, messaged everyone on my phone being like, “By the way, I’m leaving the country again tomorrow.” Got to the airport, flew out, got to London, caught the train up to Liverpool. I got to the place and found out I did not need to be there on Friday at all! It was a bit of a shock to the system because literally all I did on the Friday was get my uniform and got shown around the hospital. I was thinking, “Seriously? I came back for this?” It was fine, but if I could have taken it back, I probably would have stood up for myself a bit more and been like “Nope. If you want me, I’m starting on Monday.” That’s my biggest story from locum work I think. What are the main types of clients you see? Do you see a lot of athletes? I am primarily seeing athletes. Cyclists and triathletes are probably the main group that I’m working with. I’m also currently finishing a Master’s and we had to do a placement, so I decided to take an area that completely challenged me, involving weight loss. I’ve always been really scared of weight loss. I’m just not a weight loss dietitian. So, I was like, “Alright. Time to challenge my fears.” I decided to go with a group of boxers and I absolutely love it. It was quite confronting at first for me rocking up to this rough and ready boxing gym, but it has turned out great. I’m there once or twice a week working with the guys. I really enjoy that group and often it’s about just getting healthier habits and a lot of it is going back to basics. And then working with them on making weight and trying to do more long-term weight-making approaches rather than last minute attempts to lose 10kg in a week. Are you doing any weight cuts right before competition? And how big is it if you do it? It depends on the guys. I try and get them starting to lose the weight earlier if possible. There was one guy I was working with at the beginning of the year who needed to lose six kilos in about a month. A lot of it is to do with carbohydrate manipulation, periodising protein, and mixing carbs around when they’re doing their high-intensity sessions and cutting back around their low-intensity sessions. I try and avoid going into the extreme all-or-nothing approach if possible, but it depends on how much weight they’ve got to lose. They’ve got to have the right mind-set as well; If they’re not committed to it, it’s not going to happen. I can give a perfect meal plan, but if they don’t follow it, they won’t get the results they desire. The key is working on creating their own motivation for their goals, getting them to commit to making changes, and ideally aiming for sustained changes over a period. Ideally, we aim for a two-month period to lose weight rather than a two or three-week timeframe. It is possible to lose larger quantities of weight in short amounts of time, it just reduces their quality of training. It will also affect mood, concentration and happiness. So, it’s possible, but my preference would be to try and get them making those changes over a longer period and making it sustainable. Rapid weight loss can end up with them gaining weight afterwards because if they restrict, restrict, restrict in that week before a fight, then they can go a bit off the rails the week after and end up gaining more weight than they begun with. It’s a big cycle. That’s what I’m becoming more and more passionate about. I’m realising that I’m more interested in helping people make sustainable behaviour changes and then giving practical support and solutions. Do you work with them post-fight to try and avoid any excessive post-fight weight gain? I try to, but it’s based on their motivation. They’re generally not as motivated post-fight. Some of them are better than others though. These guys are not paying for it, since it is a placement. I find when people are paying for nutrition support and guidance, they’re more engaged and motivated. If it’s free, the accountability and value of it is not necessarily always there in the same way. With the cyclists and triathletes, what’s the main thing you’re helping them with? What’s a frequent problem you see where you can come in and assist? It’s a combination of overeating and undereating. I find that a lot will be undereating on training days and then overeating on rest days. I also find often they’re not eating regularly or consistently enough. Training is the most important thing, but not recognising the value of nutrition and how that can help them be faster, recover quicker, and be more present when they’re training and performing is another issue. So, I find that that is where I’m having the biggest impact. You’ve got quite a social media presence for a dietitian. Do you feel like that helps directly in terms of gaining clients? Not really, no. Facebook is probably my biggest following, and that just started because I had all this nutrition stuff in my head and I was like, “I need to get it out of my head so that I don’t annoy everybody around me all the time by constantly talking nutrition.” And then I didn’t want to clog up my own Facebook feed with it, so I created a page which linked up with the blog that I’d started at a similar sort of time. It literally just evolved from, “That’s an interesting post that someone’s written, I’ll share that. Someone else might find it interesting.” And then things that I’d written, I’d share on there. There hasn’t been any plan or marketing strategy at all; it’s just been organic growth. It’s evolved with me as I’ve evolved in terms of what I wanted to do with my website, my blog and now my business. I’m moving a lot more down the sports nutrition side, but I’m also interested in other areas, so I’m still working on finding my target market and my key messages. So, I haven’t done much marketing on my social media because I don’t know who I’m trying to attract through that and how to reach them. I’ve had people who have approached me and said that they’d seen me online, but it wasn’t necessarily how they found me. They were just looking for a dietitian locally or looking for a dietitian in sport. I do enjoy the process though, so I see value in it. Are they any practical nutrition tips you see yourself repeating to clients? I talk a lot about protein and spreading it more consistently throughout the day. Most people habitually don’t have any protein at breakfast, a little bit at lunch and then a massive amount at dinner. In terms of whether it’s body composition goals or recovery post-training, it is much better to be spreading it out throughout the day. I try and work on spreading their protein throughout the day and incorporating more protein in breakfast. I’m about food first. I think protein shakes have got a place, but I think a lot of people rely on them and you can often get enough protein from food, which tastes better anyway. A caveat to the protein supplements is, I do find with vegan athletes, particularly if they need to lose weight, it is difficult to get enough protein in from food sources as a vegan without relying on supplements. Most vegan protein-containing foods also come with a lot of carbohydrates, so by default they end up eating too much carbohydrate, which can then make weight control a bit more complicated. What sort of recommendations do you often make to get a high protein source in at breakfast? It’s a typical PT thing for people to say, “Just eat eggs for breakfast and have Greek yoghurt and nuts.” And to me, as an athlete, that is not satisfying. I’ll be hungry in five minutes. Even though I’m not physically hungry, my brain is hungry afterwards. It’s not enough substantial food. Some people it works for, and eggs are great, but not everyone has time to cook eggs every day and not everyone wants to eat eggs every day for breakfast. So, I think eggs are a great way to get protein in, but variety is good too. I’ve recently tried adding eggs into porridge, which works surprisingly well. I also recommend Greek yoghurt a lot and mixing it into oats, either cooked or cold. Smoothies can help if it’s something that you need really quickly. Cottage cheese as well, because it’s not adding a lot of carbohydrate or extra calories. You can get a decent amount of protein in by using half a pot of cottage cheese or Greek yoghurt. They’re common foods I recommend for people who will eat those foods. You recently did an overtraining study. Do you want to elaborate on that or share a story about it? The overtraining study was ten weeks in total. For the first two weeks, we were doing 11 hours of cycling and every week we were doing Wingate tests. You do about a ten-minute warm-up and then you do 30 seconds, all out, flat out as hard as you can go, which I absolutely hate because I’m not a sprinter. So, I was written off at the end of any of these high-intensity sessions and usually not very enjoyable to be around! We were doing a lot of Wingates and lot of sessions on the watt bikes, which were anything from an hour to two hours in length at set intensities based upon our VO2 max and functional threshold. We were also having to record everything that we were eating at the time. I’d never tracked my diet ever up until this point. I did it for the whole ten weeks, which I was very proud of because I literally tracked everything. I ate about 2500–3500 calories a day and it also made me realise I under-eat on training days and overeat on rest days as well. The training consisted of six days a week—doing about 4–500 kilometres. We were wearing heart rate monitors for everything and had sleep monitors on overnight. After the two weeks of baseline and testing we had a three or four-week period of overtraining. For me, this was 16 hours of cycling a week. I think I was doing up to 600 kilometres a week or something crazy like that. And it was interesting because I didn’t feel like the cycling was exhausting, but I found everything else that was going on in my life was the problem. It affected my mood. I wasn’t happy. I didn’t want to get on the bike. My resting heart rate was normally 49 or something, and then it went up to 88 by the end of the study, just resting. In some sessions, they would specify a heart rate to train to such as 170 and my max would be normally like 190, yet I couldn’t get my heart rate above 160. If someone was watching me, they’d be thinking, “This woman’s about to have a heart attack or something.” Everything was so much harder. I was crying all the time as well, and this was a common theme with a couple of other girls. Apparently, my mood profile was the worst because I went from a high point and then plummeted off the chart. I was only sleeping about four hours a night which didn’t help. There was a lot of factors going on outside with work and uni. I think that had an impact on how much it affected me. It was very interesting, but there were days where I knew that I needed rest, but I had to keep to this program. I stuck with it because I didn’t want to let the guys down. But, it’s taken me a long time to recover from it. I think it’s because I have been busy this year as well… if I’d had a month off doing literally nothing, it probably would have been a lot easier. It was a good learning experience in terms of how I can help clients pick up on cues that they might be training too much and benefit from some extra days off. Not something I would willingly go and re-do though! Is there anything you’d like to wrap it up with or anything you’d like to leave the readers with? Consistency is the key. Nutrition needs to be an everyday thing, not just on race day. It’s about making small changes that are consistent across the training weeks. Don’t try to do everything overnight because it usually only lasts a couple of days before you give up. It’s far more sustainable to make one change at a time and then build up block-by-block, which is what I’m trying to work on with the athletes that I see. 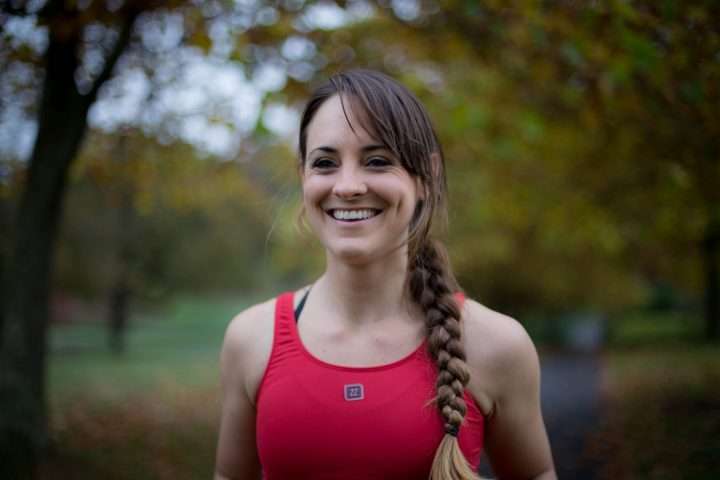 Gemma is an Australian Sports Dietitian & Nutritionist based in Liverpool, UK with an online nutrition consultancy. She is passionate about practising what she preaches and helping others to live healthier lives. Follow her at Dietitian without Borders to find out more about her love for travel, nutrition, food, sport and zest for life.